What purpose does a graphic overlay serve? The topmost layer is known as the Graphic Overlay, which serves as the visible representation of the device’s user interface panel. 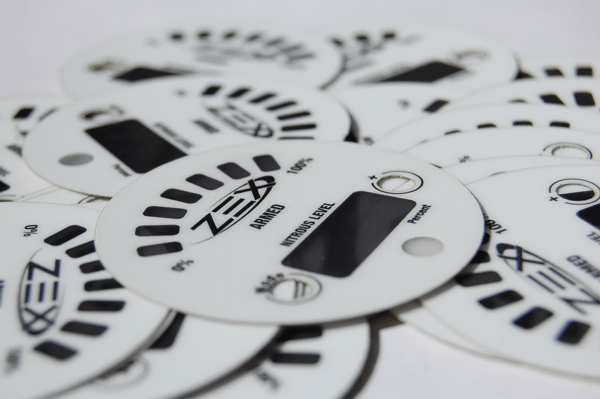 It may be a single layer with adhesive backing, atop of a membrane switch or used to activate micro switches. It is essential to design a graphic overlay that is both constructed effectively and offers an eye-catching design. Custom Graphic Overlays serve as an excellent canvas for high resolution graphics for companies to showcase their graphics and logos, catching the eyes of customers. As the main appeal of a product, the right materials and performance capabilities are important factors. Materials like polyester are preferred for their durability and long life span, while polycarbonate is not as rugged or chemically resistant, but offers a crisp design. Material selection is important due to the mechanical requirements of membrane switches. Polyester will survive millions of actuations and is solvent resistant, making it ideal for membrane overlays. Other materials will crack in time as the switches are repeatedly pushed. Functionally, the graphic overlay is often used to protect moisture ingress into the user interface unit. Manufacturers have an essentially endless array of design options for customizing a graphic overlay, including embossing, coloring, tinting, display windows, backlighting and texturing. I have read your blog. Really helpful for a user to know about "what is Graphic Overlays ?" How is a Membrane Switch Made?